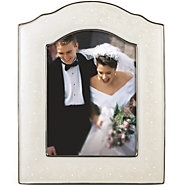 Our popular china pattern lends a romantic feel to the fine china Opal Innocence 5" x 7" Frame. Here, pearl-like enamel dots are elegant against an opalescent background. The frame, trimmed in precious platinum, makes a perfect engagement or wedding gift.